On Wednesday, Rwanda Defence Force will yet again roll-out its medical equipment, farm and engineering tools into several parts of the country to begin free treatment for the sick, ploughing and build houses for the vulnerable. According to a communiqué released this afternoon, the RDF is scheduled to conduct its revered Citizen Outreach Program (COP2019). “This year’s program will be conducted from April 17th to June,” reads part of the communiqué. The program anticipates having 137,900 patients treated of various sicknesses and within this, the RDF will improve sanitation. Also 1141 houses are slated to be built to benefit the most vulnerable citizens across the country. Meanwhile, during this program, the RDF says will engage in agriculture activities during which 11139 hectares of land will be cultivated. The force will also ensure that 453Kms are earmarked for soil erosion control and environmental protection while 1114 ha of terraces will also be developed. Most of these gaps will be those identified by different districts in areas including; Agriculture, Health, shelter and infrastructure and others. The RDF will be executing its program in collaboration with Agriculture Ministry, Health ministry and local government ministry as another opportunity to address specific issues of human security. “The liberation struggle on the battlefield succeeded because those who were fighting worked with citizens. It is this spirit of unity that we want to maintain in order to transform this country,” President Paul Kagame said last year. 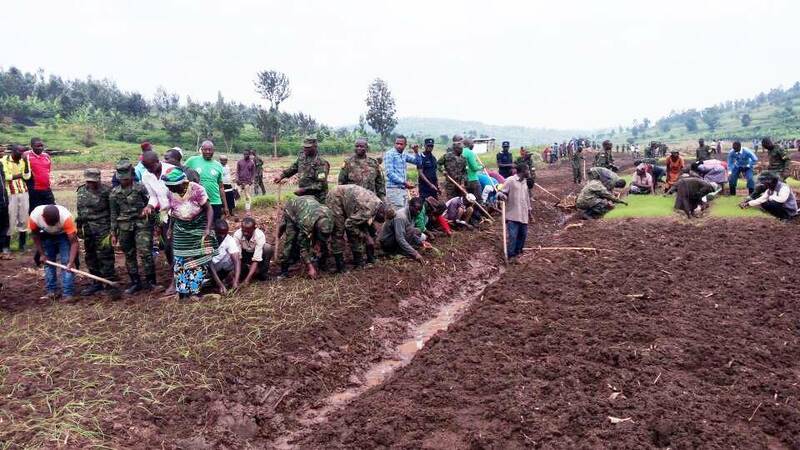 Under the same program last year, the RDF treated 113,000 patients, constructed 1,961 houses, 121 classrooms and 108 school pit latrines for the vulnerable in areas selected, conducted agricultural activities on 4,511 Hectares of land.